Global flatware for creative table settings. Contemporary stainless with a difference. Priced so you can use it at your biggest gatherings, this flatware has resin "bamboo" handles fitted with chrome implements, so it's dishwasher safe. With organically shaped handles inspired by the unique texture of bamboo, this 5-piece place setting in durable stainless steel adds flair to everyday meals. 20-piece flatware set includes four five-piece place settings. 24K gold-plated 18/10 stainless steel. Bamboo-motif handles. A striking sculptural handle paired with gleaming heads brings rustic sophistication to Hampton Forge's Dali Wood flatware. The 16-piece set features contemporary style with a touch of whimsy. 18/10 stainless steel flatware with resin handles. Service includes four five-piece place settings. Dishwasher safe. The Hampton Forge Lynden place setting's stainless steel and natural wood design is ideal for an organic meal or a steakhouse-style dinner. The Argent Orfevres Lynden place setting's stainless steel and natural wood design is ideal for an organic meal or a steakhouse-style dinner. Five-piece setting. Hand-forged stainless steel Capture a countryside air with the rustic flair of the faux wood handles on Villeroy & Boch's Artesano stainless steel place setting. The standout look of Cambridge's Priya Brass Mirror 5-piece place setting adds remarkable elegance to your tabletop The Hampton Forge Marion White place setting features gold-tone stainless steel plus a handle hue that perfectly accents today's dinnerware designs. To make a striking impression, go for the glam of gilded stainless steel in the standout design of Hampton Forge's Epigram Gold place setting. The standout look of Cambridge's Samantha Gold Mirror 5-piece place setting adds remarkable elegance to your tabletop. Five-piece setting. 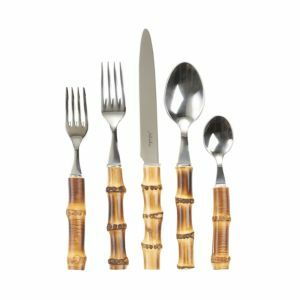 Stainless steel, brass, aluminum Add a warm glow and country charm to every place setting with the Lucky Brand Rumble copper-colored stainless steel flatware service for four. Knork's 5-piece flatware set combines sleek lines and modern design with everyday functionality, finished in an antique copper finish for the perfect table setting. Forged stainless steel with gunmetal finish. Dishwasher safe. 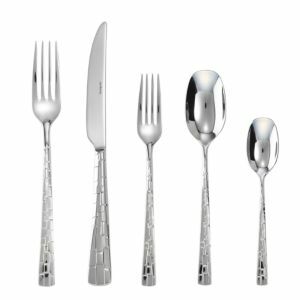 Smooth lines and sturdy molding highlight this 5-piece flatware set by Knork in shiny, titanium coated 18/0 stainless steel. Shaded with a smoky hue on stylish silhouettes, the Hampton Forge Opera stainless steel place setting brings drama to your dining table. Beautifully crafted primavera 5 piece place set great for all events and occasions. This stainless set is a perfect addition to all decor styles and has a quick and easy clean. Beautifully crafted rapallo satin 5 piece set great for all events and occasions. This stainless set is a perfect addition to all decor styles and has a quick and easy clean. Beautifully crafted contorno 5 piece place set great for all events and occasions. This stainless set is a perfect addition to all decor styles and has a quick and easy clean. Beautifully crafted spirale 5 piece place set great for all events and occasions. This stainless set is a perfect addition to all decor styles and has a quick and easy clean. Beautifully crafted labirinto 5 piece place set great for all events and occasions. This stainless set is a perfect addition to all decor styles and has a quick and easy clean. Slender twists lend a contemporary flair to Ricci Argentieri's Regale Satin flatware set, a service for eight plus a hostess that that brings coordinated elegance to any occasion. A fresh twist on fine stainless steel, the Oneida Riverine place setting adds a refined edge to rustic tables or dimensional flair to more formal settings. 18/10 stainless steel. Dishwasher safe Understated and beautifully styled, the New Wave 5-piece place settings lend a modern, minimalist touch to your tabletop. Made of superior 18/10 stainless steel. 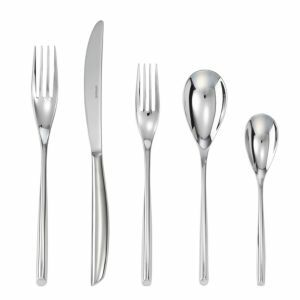 Knork's Curve 20-piece flatware set combines sleek lines and modern design with everyday functionality, finished in a polished chrome finish for the perfect table setting. Texture makes this new pattern very unique. Attention to detail has been given to the intricate handles. Casual, perfect for everyday use. 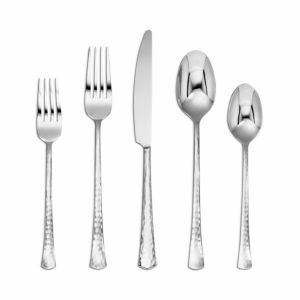 As practical as it is polished, the Bellasera flatware set features contemporary styling with a brilliant, mirror-like finish in stainless steel that will complement any table setting. Zwilling J.a. Henckels flatware is heavy gauge weight, produced from 18/10 stainless steel. The 18% chrome provides for maximum corrosion resistance and the 10% nickel gives each piece a brilliant finish. The rope-textured edging and sailboat motif of Towle's Nautical flatware set is perfect for a beach house or to give salty style to any setting. Handcrafted flatware service and stand sold separately. 18/8 stainless steel. Dishwasher safe. Flatware made of 18/10 stainless steel. Mirror finish. Dishwasher safe. Zwilling J.a. Henckels sets your table with the sophisticated simplicity of slim rounded handles accenting the elegant proportions of the Helia place setting. Slender silhouettes with twists of texture at the handles, the Oneida Lunette stainless steel flatware set's understated style adds fresh flair to any table. Set your table in style with this essential 65-piece flatware set from J.a. Henckels-a must-have for any regular entertainer.